happy new year!! i’m back at school, and i think this quarter will be a doozy. if i keep my schedule as is, my wednesdays look something like this: 9:30am – 1pm, 2 – 4pm, 7 – 10pm. ouch. so in that vein, i’d like to introduce a new mini series, college meal chronicles. easy and fast food with only a few ingredients. tasty as always. and of course, you don’t need to be in college to make these. i do have to say that i was skeptical of this greek yogurt pasta. people loved it on food52 and obv it sounded good enough for me to bookmark it, but when i was plating it up, i was like, this is a beige bowl of food. in addition to the fact that i didn’t have faith in the yogurt. it’s just yogurt; there’s no way that can make a good sauce. and remember how grainy and weird that yogurt mac and cheese you tried to make last summer was? well greek yogurt, i owe you an apology. because that sauce was creamy and rich and so much more than just yogurt. and you know how mac and cheese gets kind of hard and crusty and dry at room temperature or after it’s been refrigerated? this does no such thing and stays unctuous. the tang of the yogurt is softened a bit by fruity extra virgin olive oil, and the mellow, sweet onions. basically, comfort food. 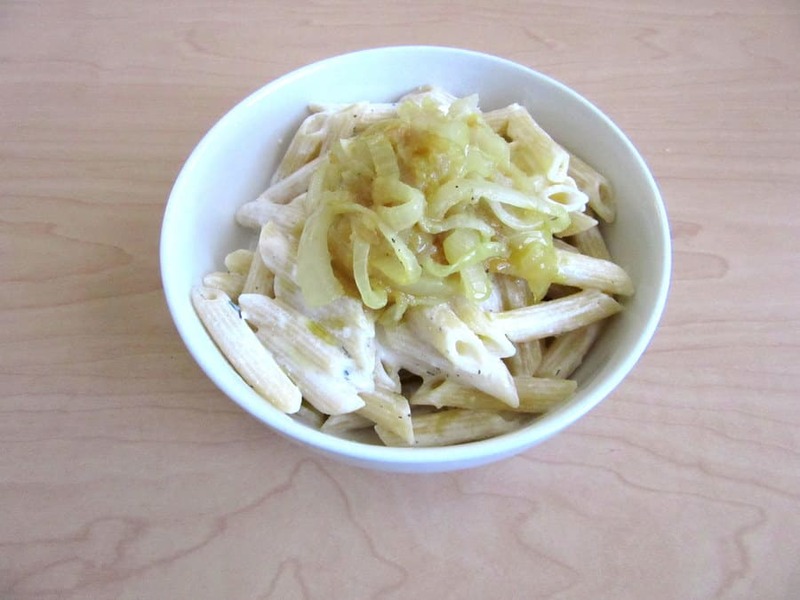 i highly suggest you try making this base recipe with the greek yogurt pasta and onions first. it’s so tasty that you can just leave it and be perfectly happy. then for your next batch switch it up if you want. i mixed the sauce into pasta with broccoli, garlic, parm and scrambled eggs (which i think are completely underrated), used it as a dip for veggies, and dolloped it on top of salad for a makeshift dressing. there’s also a lot of great suggestions in the original recipe link, including spinach, lemon zest, bacon, garlic, toasted nuts, mushrooms, peas, mint, tahini, etc. Heat some oil in a large skillet over medium-high heat and add the onions and garlic. Decrease the heat to medium-low and cook, stirring frequently and seasoning with salt to taste, until the onions are soft and golden brown, 20 to 30 minutes. Or if you’re low on time and are okay with crunchier onions, saute them over medium-high heat until translucent. While the onions are cooking, cook the pasta in boiling salted water until al dente, about 8 to 10 minutes. Drain the pasta, but reserve 1/2 cup cooking liquid for the sauce. Combine the yogurt with 1/4 cup pasta water. Add more pasta water if needed. It will look thin and weird, but don’t worry! Trust the yogurt. Toss the pasta with the yogurt mixture. Sprinkle generously with cheese and top with the onions. Drizzle with a generous amount of extra virgin olive oil. Serve the Greek yogurt pasta immediately. This recipe looks great! I've been really trying to "up" my caramelized onion game. it’s an amazing caramelized onion recipe (: other ideas for sticking caramelized onions into everything: on pizza, in omelettes/frittatas, in salads (warm, cold, pasta, grain, bean, etc), in grilled cheese, etc. Im obsessed with greek yogurt, I've been trying to find new and interesting ways to use it in my dinners. Im going to give this a try. Do you have a favorite brand? I was born in Greece Heather and I’ll tell you my opinion that Fage Usa is as authentic as can come to the making and producing the Greek yogurt here in the states as it is in Greece. The taste of that yogurt blows away all the competition sorry 🙂 Great recipe btw.